Synthetic peptide conjugated to KLH derived from within residues 150 - 250 of Human CD36. 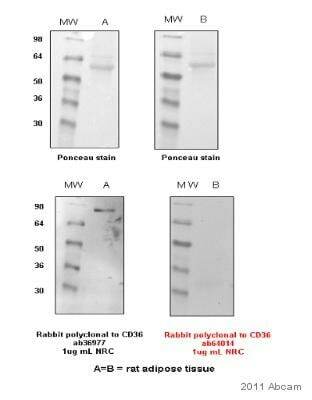 Recombinant Human CD36 protein (ab114165) can be used as a positive control in WB. 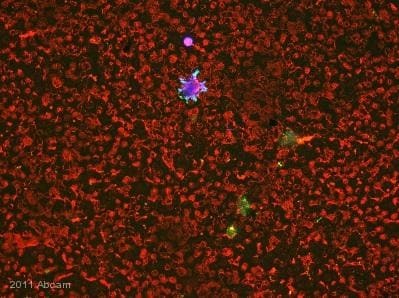 This antibody gave a positive signal in Human Platelet Whole Cell Lysate, as well as Human Spleen and Adipose tissue lysates. Our Abpromise guarantee covers the use of ab64014 in the following tested applications. WB Use a concentration of 1 - 2 µg/ml. 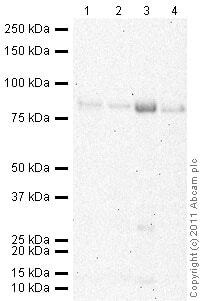 Detects a band of approximately 85 kDa (predicted molecular weight: 85 kDa). 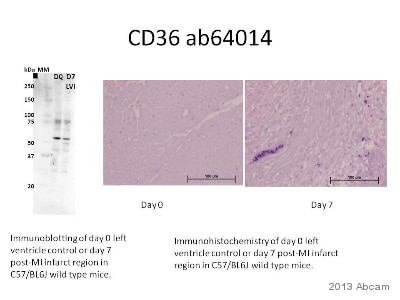 CD36 contains a number of potential glycosylation sites (SwissProt) which may explain the bands observed at 85 kDa. Abcam welcomes customer feedback.